Snoring is an issue that affects over 90 million Americans. Of the 90 million that snore, about a quarter have mild to moderate sleep apnea. These numbers are similar in most other developed countries. What’s the cause of this epidemic? Why are so many of us snoring? Why is snoring and sleep apnea so prevalent in developed countries such as the US and UK? Perhaps the abundance of calorie dense, fortified junk food is to blame. Sixty-six percent of Americans are considered obese or overweight. As we are all aware, obesity can cause a number of ailments which includes snoring and Obstructive Sleep Apnea (OSA). The reason being is because excessive fat around the neck tends to apply pressure around the airway which can partly restrict the movement of air. When the airway is obstructed, snoring, and in some cases, OSA will occur. Those with a Body Mass Index (BMI) of over 25 are considered either overweight or obese and are at higher risk of developing a snoring condition or OSA. Also, men with a neck circumference that is greater than 17″ or women with a neck circumference of greater than 15″ are at higher risk. For every unit increase of BMI, you are 14% more likely to develop one of these two conditions. In other words, losing as little as 7 lbs can reduce your chances of developing either condition by 14%. If you were to lose 14 lbs or a reduction of two units, you are 28% less likely to snore. Keep in mind that snoring and OSA are not always caused by being overweight, although this is the most common reason. Other factors such as enlarged tonsils or adenoids as well as physical obstructions in the airway can also be causes or contributing factors. If you were once of average weight and have gained weight and notice an increase in snoring or daytime tiredness, it’s quite possible that being overweight can be the cause. If you have any concerns, you should first speak with your doctor. The American College of Physicians recently released new guidelines for the management of OSA which focuses on weight loss in conjunction with treatments such as CPAP and oral appliances. The recommendations also apply to those who snore but do not have OSA. These guidelines are quite practical as it’s well known that extra weight, particularly in the neck area, can cause snoring issues and OSA. It goes without saying that reducing the amount of fat around the airway can ultimately eliminate snoring. When it comes to losing weight, there’s a lot of great information available online so there’s no need to go into detail. Here’s a short list of items that will put you on the right track to losing weight. A plan by itself is not going to cause you to lose weight. You will need to remain committed throughout your weight loss journey and beyond. Unfortunately, it’s quite common for people to lose a substantial amount of weight and then quickly regain it over the course of just a few months. The most common reason is that they regress back to old eating habits and stop exercising which will cause the weight to reappear. It can take several months to lose just a few pounds. If you are dealing with a snoring problem, you are probably interested in solving this issue now rather than several months from now. While weight loss should be considered the ultimate goal, there’s actually a small device that can be used to help prevent snoring in the meantime. Generically, it’s called a snoring mouthpiece. More specifically, it’s called a mandibular advancement device. They are highly effective, easy to use, and typically cost less than $100. Here’s a chart which lists all of the products that are available along with a product review of each. If you decide to try a snoring mouthpiece, be sure to choose a reputable seller for safety reasons. Look for mouthpieces that are FDA cleared, BPA free and made from a medical grade material. 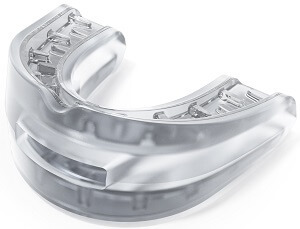 Snoring mouthpieces can be used for weight loss. Eventually, the goal should be to completely eliminate snoring without having to use any such device. Also consider sleeping on your side, which helps to keep the airway open and reduce snoring. By sleeping on your side, gravity helps to shift fat around the neck to the side and prevent it from pressing against the airway. Remaining on your side throughout the night can be fairly difficult if you have a tendency to sleep on your back or stomach. One way of preventing rollover is to purchase a pillow which uses a stopper to prevent you from rolling over on your back. Since these pillows can be fairly expensive, a less expensive alternative is to wear a tee shirt to bed and fasten a tennis ball to the back using a rubber band. As you roll over in your sleep, the ball will cause discomfort and help to keep you on your side. 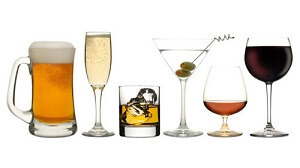 Alcohol is a sedative that contributes to snoring and should be avoided. Did you know that drinking alcohol prior to bed can further agitate snoring? As we sleep, the muscles in our airway relax and the airway becomes restricted. Because alcohol is a sedative, your muscles can become extremely relaxed and compound the problem of snoring. If your partner notices an increase in the intensity of your snoring after you consume alcohol, you may want to consider skipping the nightcap. Being overweight and snoring – Is there a relationship between the two? Is sleep apnea causing me to gain weight? Next post: Married Couples who Sleep in Separate Bedrooms because of Snoring – What can be done?